DianeClehane.com: Kate the Great: The Duchess of Cambridge is the Queen of All Media! Kate the Great: The Duchess of Cambridge is the Queen of All Media! Who's having a better week than Kate? On Sunday, Kensington Palace released four new photographs of her daughter, Princess Charlotte, on the eve of the royal tot's first birthday. The charming images of the adorable toddler were taken by none other than her mother at Amner Hall, the family's home in Norfolk. They promptly sent the Twittersphere into overdrive (5.4 million retweets and counting.) The masters of understatement, Kensington Palace released the photos tweeting, "We hope that everyone enjoys these lovely photos as much as we do." Kate is the first royal who has officially photographed one of their own other than Lord Snowdon who was married to Princess Margaret and famously shot Princess Diana for her Vogue cover in 1991. The Duchess' photographs of Prince George have also been released by the Palace at various intervals. The Cambridge's candids capture a warmth rarely seen in royal portraiture. Of course it would be pretty much impossible to take a bad photo of either Prince George or Princess Charlotte, but Kate has demonstrated a marked sensibility in composing the timeless shots. I interviewed photographer Alistair Morrison, whose celebrated works hang in the National Portrait Gallery in London, for my 'Lunch' column a while back and he revealed to me he'd mentored Kate when she first began exploring her interest in photography. "She has a very good eye," he told me. "And she's a very clever talented, young woman." Alistair, who has photographed both Kate and Prince William, told me "[Kate] has been extremely well-advised. [The royal family] has been very clever about controlling her image while creating a sense of accessibility." 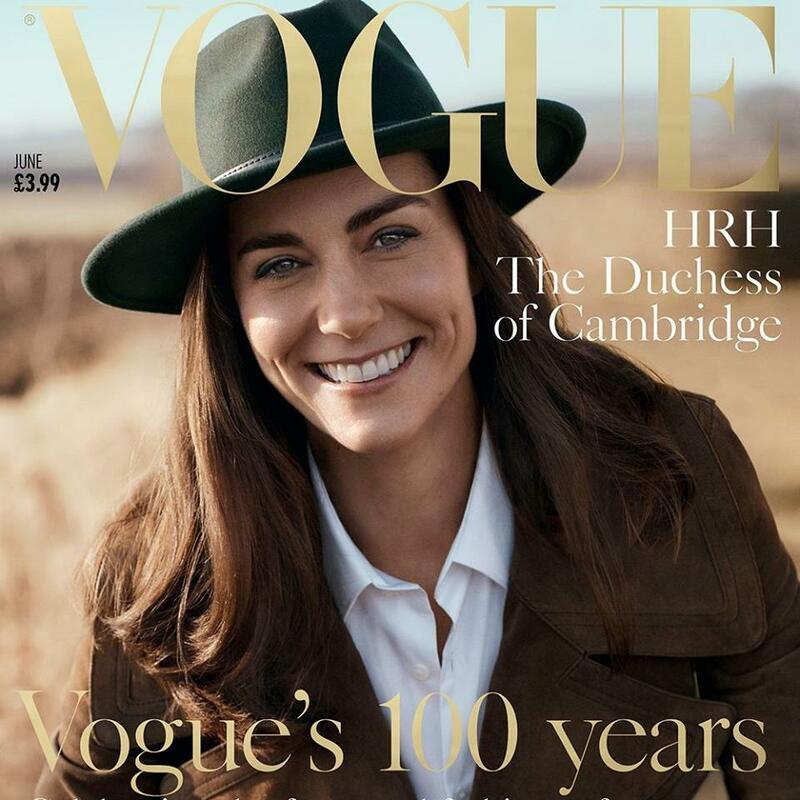 The just released photograph of HRH The Duchess of Cambridge of the cover of British Vogue is a stunning example of that unique blend of stardom that has given a new luster to the royal family's formerly fusty image. What a difference a few decades make. 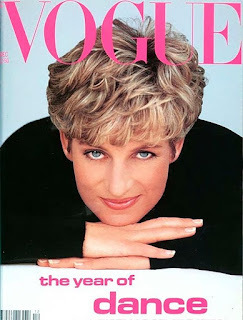 When I saw Kate's smiling out from the cover, I immediately thought of the equally gorgeous and unpretentious image of her mother-in-law, Princess Diana, who adorned the cover of the same magazine in 1991. It's fascinating to see how the Duchess is following so brilliantly in Princess Diana's footsteps, yet clearly forging her own path. It is also quite sad to think that while Diana was thwarted at every turn for having too much star power, it is Kate's unique brand of glamour and her surging popularity (and that of her sweet young family) that have propelled and reinvigorated the royals in a way not seen since Prince William's mother captivated the world. What's changed? Plenty. At 19, Diana was a shy, well-bred young woman who had no idea what she was getting into when she married into the world's longest running soap opera. Left to fend for herself navigating worldwide fame (and this was long before the Internet came along!) her husband and the other royals grew increasingly frustrated at having to cede the spotlight to her. It was never something Diana sought out, but the public's adoration proved to be her only source of consolation while trapped in a loveless marriage. Over time, she learned to brilliantly leverage it her advantage and in the last years of her life, used it effectively to further her humanitarian goals. In death, Diana brought the monarchy to its knees when the public turned on the royal family blaming them (and Camilla) for Diana's tragic fate and their tone-deaf reaction and lack of some real show of emotion. From the moment it became apparent that William would take Kate as his bride, everything was expertly managed. Kate, having navigated a decade orbiting the royal inner circle, had the advantage of learning over time. After the engagement, she was coached by a team of advisors and-- irony alert -- even given films of Diana exiting cars and dealing with red carpets to study so as to see how to handle the media with grace. And, of course, the major difference between Diana's experience as a royal and Kate's is that Kate married a man who loves and wants her very much to succeed. And so does the entire royal family. Smart enough to realize the future of the monarchy largely depends on the public's acceptance and appetite for Kate, Prince William and their children, they, too have embraced the idea of giving the public (controlled) doses of the royal life in situations and settings that were previously off limits. The website created especially for Kate and William's wedding was a masterstroke of public relations. Everything since then, from the Cambridge's meet and greet with the press on the hospital steps days -- and in the case of Charlotte's birth -- hours after their children were born to the cheeky video which depicted the Queen with actor Daniel Craig parachuting into the Olympics, has been given a glossy coat of aspirational accessibility. To their credit, Prince William -- and especially Prince Harry -- have been quite vocal in saying that the royal family's newfound openness is due, in large part, to their mother's legacy. It's that brilliant mix of the aspirational and accessible (that Diana perfected) that is captured so perfectly in Josh Olins' photograph of Kate on the June cover of British Vogue. Eschewing a tiara for a wide brimmed fedora, the Duchess conveys her warm, sporty side wearing a classic white shirt, suede jacket and, of course, a wide smile. Any yummy mummy could picture herself in the same look bought at Ralph Lauren. Inside the issue, which marks the publication's 100th anniversary, there are more photographs of Kate by Mr. Olins which are accompanied by an interview conducted the magazine's editor, Alexandra Shulman. Three years ago, Ms. Shulman told the Mirror she'd love to have Kate grace the cover of the iconic publication. She finally got her wish and then some. In a preview of the images, the Duchess looks anything but formal -- she looks like she's just had a good laugh. One black and white image even dares to show some (gasp!) wrinkles on the royal visage as the sign of a life well lived. In contrast, Diana with her steady gaze and bemused smile while wearing a simple black turtleneck shows her at her most beautiful with nary an imperfection in sight. It all seems rather fitting, doesn't it? Kate's image is like a very well lit candid with minimal makeup (or so it seems) while Diana's photo has an otherworldly glow. We will watch as Kate inevitably grows older -- gracefully, I'm sure. Diana, who died at 36, will always be forever young and forever beautiful. How great could it have been so have both women pose together for Vogue? But it was not to be. The June issue of British Vogue goes on sale on Thursday.